I bought a house in Ireland. Three weeks is plenty of time. When I left for Galway on March 23, that’s what I thought, anyway. I was not, however, prepared for the crazy housing market. My job, while my husband worked at the Galway branch of his company, was to find a place to live for when we return in June permanently. Initially, we intended to rent for a year or so, have a chance to adjust to our new country and then decide where to buy a house. It turns out that renting in Galway is very expensive. As a result, anything decent, that is also not outrageously priced, is snapped up quickly. So every time I called about a house or apartment to rent, it was already gone. Only places at the extremes –either very high end or absolutely wretched– were available. By the end of the first week of searching, I was beginning to get nervous. Week two, with the advice of my husband’s coworkers, we warmed up to the idea of buying a house. We have, after all, been visiting the area for over 14 years and explored it thoroughly. Home buying does not work quite the same way as it does in the states, though. An estate agent (realtor) doesn’t take you around to see properties listed by other agents. Rather, you contact an agent who is listing a house you’re interested in and he or she will show you the place. I must have spoken to 10 or more agents while searching. In the midst of all this, I visit our new bank in Ireland and speak to one of the customer service representatives. Of all the experiences I’ve had, the one with our bank is the best. Everyone was kind and super helpful. Unfortunately, they also informed me that without a record of Irish credit, we would not qualify for a mortgage. It would take 6 to 9 months of weekly salary deposits for us to even get a credit card. And it doesn’t matter at all how much money you have in the bank. This changes everything. Now I have to narrow my search to homes we can pay for with the proceeds of the sale of our Bucks County home. Stress level rising. Finally, at the end of week two, we found a really great apartment for sale in a town about 15 minutes away. Orenmore is a coastal village, full of shops, pubs, restaurants, etc. and would have been walking distance to the beach. Perfect, right? Yeah, a lot of other people thought so too. We got into a bidding war over the place. Our final offer would have been accepted but the seller wanted to close sooner than our June date. Lost out again. Now I’m really pushing the panic button. I am imagining us living in an Air BnB, bleeding money. I’m thinking how we might have to settle for a really crappy rental or a super long commute from an outlying town. I’m wondering if I’ll be able to walk places like I hoped to. We needed to expand our search. We looked at a place in Tuam, a 40 minute drive from Galway. Priced right, the pictures online showed a modern, spacious, nicely fitted and well decorated town home. We visit it and discover it is in a ‘ghost estate’ –one of the developments the builders abandoned during the housing crash in 2008/2009. It backs up to a sports stadium. No joke, I could see the entire playing field from the upstairs windows. It faces half built homes surrounded by chain link fence. The neighborhood is grim. I need a drink. We drive back to our hotel in worried silence. We spend the rest of the evening feverishly searching. And … we find it. The perfect place — only 20 minutes from Galway in a village called Headford. We call and it is still available. We go see it immediately and breath a sigh of relief. It’s also a townhome but in a quiet peaceful estate. It is an end unit in a row of three on a cul de sac. My front view is a sheep pasture surrounded by old stone walls. I can walk to the village, the supermarket and best of all, the pub! It feels like home. We put down our deposit, hired a solicitor to handle the contracts, found an engineer to do our inspections. Just in the nick of time. I’m going it alone for Monochrome Monday this week. I’m able to walk to Ballyloughane Beach from the place I’m staying in Galway. No, it’s not tropical, nor is it warm but it’s along the Wild Atlantic Way – a beautiful stretch of rugged Irish coastline. And it’s wonderful to wake up in the morning and hear the seagulls calling. In Eyre Square, the center of the old city of Galway, there hang 14 banners with the names of the tribal families of the region. On one of those banners is the name O’Flaherty. The O’Flahertys were the most notorious of the 14 families. Their men were known to be drinkers, fighters and ruthless killers. It’s said that when you were going to bed at night to say your prayers, after thanking God for all your blessings and forgiveness of your sins, you’d finish the prayer by saying, “God preserve us from the ferocious O’Flahertys,” because it was a real possibility, that on their way home from a night of drinking and carousing, if they passed by your house, the O’Flaherty boys might decide on a whim to break and and kill the lot of you. Now what does that have to do with a Galway girl? Well, it has to do with the woman one of the O’Flahertys married. There was a young lady named Grace O’Malley (Gráinne Mhaol) nearly as infamous as the O’Flahertys. Little Grace was the daughter of a pirate. And rather than play with dollies and stay at home with her Mam, Grace craved to follow after her father’s footsteps. Her father of course, thought this was ridiculous and told her to settle down and be a good girl. Grace was having none of it. 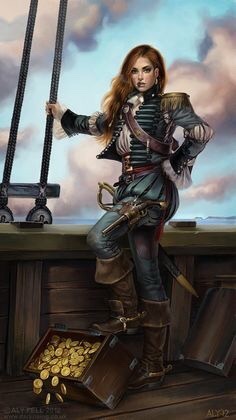 So great was her desire to go to sea, that she cut off all her hair, stole the clothing of a neighbor boy and sneaked onto her father’s ship just as it was about to go out of port. It was only after they were far away from land that Grace revealed herself to her father. Her father, naturally, was angry, but he also saw Grace’s determination and ferocity. So he set about to take the girl under his wing and teach her the ways of pirating. Grace eventually took over the family business and became known as the Pirate Queen of Ireland. Grace outlasted two husbands. The first -O’Flaherty- was killed after sustaining grievous wounds in a fight. The second -Richard Burke- was a wealthy lord and landowner. However, after just a year of marriage, legend says that O’Malley and her followers locked themselves in Rockfleet Castle and she called out a window to Burke, “Richard Burke, I dismiss you.” This effectively rendered them divorced. But she retained much of his holdings. Later, after having dealings with Queen Elizabeth I, it’s said that the English Monarch developed a soft spot for Grace. Grace claimed that both of her husbands had abused her during their married lives and this evoked pity from the Virgin Queen, so much so that as Grace attained old age, the queen bestowed a pension upon the Pirate Queen of Ireland. So let’s hear it for the Galway Girl. Cunning and fierce, wealthy and powerful. And as wicked as they come!